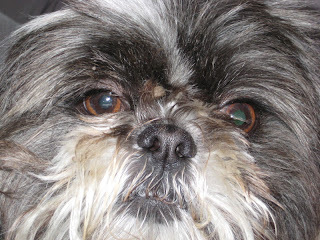 Bella - my sweet, defenseless Shih Tzu - was attacked during a recent visit to LA. We had been staying at a house in Laurel Canyon and about ready to leave, when Sox, an otherwise mild-mannered female Husky, suddenly turned and bit Bella on the head - engulfing it entirely within her large mouth. I stood and watched as it happened. There was no warning -- they had been around each other all weekend. It was over in less than a second. I rushed to pick Bella up to protect her and check for injury. Though she was terrified, there was no blood. I thought everything was OK. Then, I noticed her eye globe filling with blood and my concern returned. The eye began to swell -- and swell, and swell, and swell. I watched as it bulged so large that it looked as if it would pop out of the socket -- then, it did just that. It was a horrible experience to witness so helplessly. It turns out that this is not an unusual problem for small, flat-faced (brachycephalic) breeds like Shih Tzus, Pugs, and Pekingese. The eye sockets for these breeds are set shallow within the skull making proptosis a not uncommon problem. We rushed her to an emergency animal hospital in LA on a Sunday night. They repositioned the eye and stitched the eyelid closed over it. There was a chance that she would recover the sight. The brief and simple operation cost close to $2,000. We then drove from LA to UC Davis, one of the best veterinary clinics in the world where she was examined by Dr Maggs - who literally wrote the text book on veterinary opthamology - and his team. After an ultra-sound examination, the prognosis was bleak. The experts gave virtually no hope for recovery of sight in the eye and scheduled her for surgery the next day to have the eye removed. Instead, we drove to Ashland, OR where we met with a healer, who prefers to work anonymously. She is a beautifully, kind woman who radiates a soft glow. After calming Bella for a few minutes in her arms, she closed her eyes and then said, simply, that she had done what she came to do. I was both grateful and hopeful. 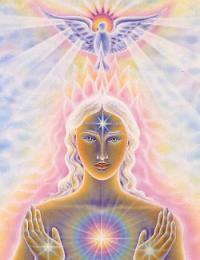 Inspired by this healer, I began to give Bella daily touches of love. She seemed to be doing well despite calls from UC Davis and other vets urging me to go ahead with the surgery to remove her eye. But, I wanted to give her every chance to keep it and continued to treat her with love and antibiotics for 3 more weeks. Finally, the sutures were removed to reveal an eye that was cloudy, but hydrated and vascularized. I had hope and a tear in my eye as I left the vet's office. Now, nearly 3 months after the incident, the eye still reveals the scars of trauma. I don't believe that she has sight in the eye, though it moves in sync with the other eye and seems to be responsive to light. It's heartbreaking, though she doesn't seem to be suffering. What is it like to have one's own child injured? Finally, I attended a seminar offered by Lisa Hartnett, another lovely soul with unspoiled grace and sensitivity. She claims to communicate with animals. There, I learned much about what I had come to understand about tuning into human channels (see The Perfect Chord). I put the rational mind on hold and listened to the subtle intuitive mind. I can't say that I believe it is an actual communication in the sense that we are accustomed to, but there seems to be a tuning into the vibration of another being -- in this case, an animal. I was informed by a participant in the class - a Reiki master - that Bella had been with me in past lifetimes and was more concerned for me than for herself. By tuning into Bella's experience, it seemed that the sight in the eye is not as important to her as it is to me. She felt more traumatized by the attack and is satisfied to have survived. She doesn't experience her world in the same binocular way that we experience our world. For her, life goes on -- and she looks forward to more belly-rubs. I agree, small/flat faced and short nosed puppies tend to have eye problems. They also tend to have breathing problems. We just have to watch over pekingese care carefully because these problems are normal. I understand how vision issues affect your ability to work, and it's very frightening.